Three poems by three authors on the theme of "escape". Winner and runners up from our micro fiction vs poetry writing competition. The following collection of poems are the winners and runners up from our “Escape” micro fiction vs poetry contest (Sept-Oct 2012). Competition entrants were asked to write no more than 150 words with the theme of “escape”. For more details about our current and past contests, visit our Competitions Page. The winners from the micro fiction category can be viewed HERE. to a hotel in the city. Turn the radio on and let the landscape fly. Let the apple boughs sway in the sun if they want to. whistle to strangers on the street below. There’s nothing here but fields of grass and open sky. Let the others sit in chairs and fall asleep if they want to. to take a different point of view. and see the world from a hotel window. is wistful for sad spreading planets. 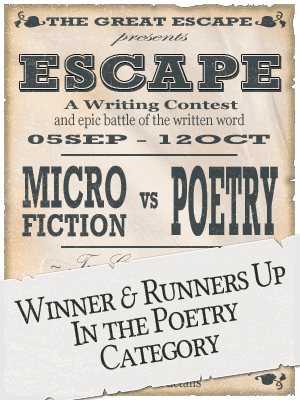 Find our more about the contest results in "Escape" Micro Fiction vs Poetry Contest winners announced.